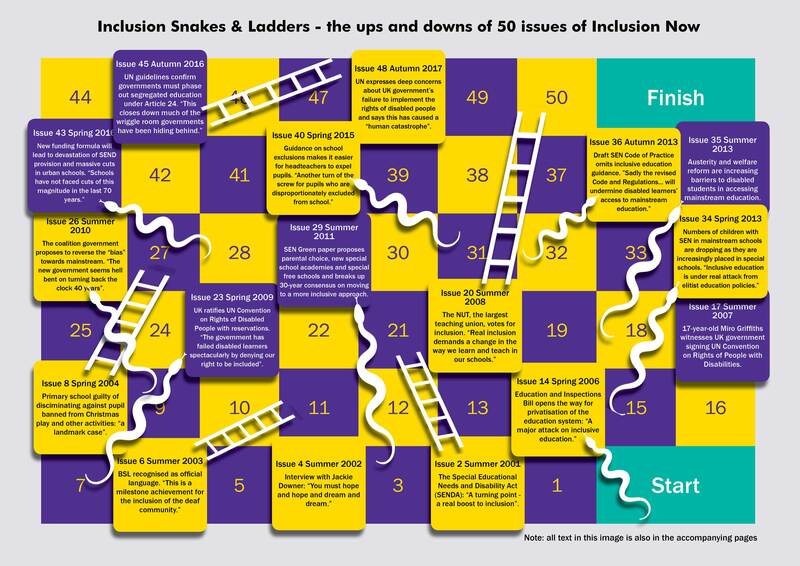 Home » News & Briefings » Inclusion Now magazine » Inclusion Now 50 » Inclusion snakes and ladders! Issue 4 Summer 2002. Interview with Jackie Downer about her education. “You must hope and hope and dream and dream”. Issue 8 Spring 2004. Primary school found guilty of discrimination against pupil who was excluded from the school Christmas play and other activities because of disability. “This case is a landmark case for families fighting for inclusion”. Issue 15 Autumn 2006. A parent of a Disabled child explains why, with hindsight, separate special school was the wrong choice. “We realise now there is no miracle cure. The longer we focus on the impossible the longer we keep our lives and our daughter’s life on hold”. Issue 29 Summer 2011. SEN Green paper proposes parental choice, new special school academies and special free schools and breaks up 30-year consensus on moving to a more inclusive approach. “We will need to keep inclusion as one of our goals for a good local school for every child in every area, rather than inequality of choice and privatisation”. Issue 31 Spring 2012. Attempt to overturn law on inclusive education fails at Court of Appeal. “This underhand conspiracy to change the law against inclusive education has been seen off”. Issue 34 Spring 2013. Figures show that for the first time in years the number of children with SEN attending mainstream schools is dropping as they are increasingly placed in special schools. “We believe inclusive education is under real attack from elitist education policies”. Issue 36 Autumn 2013. Revised draft SEN Code of Practice accompanying the Children and Families Bill omits inclusive education guidance. ”Sadly the revised Code and Regulations, like the Bill, will undermine disabled learners’ access to mainstream education”. Issue 37 Spring 2014. Professor Gus John, chair of Communities Empowerment Network, criticises education reforms. “Current education reforms are logical given the type of society the government is seeking to build. It is one of rampant individualism, greed, xenophobia, and a shameless attack on the poor and marginalised”. Issue 39 Autumn 2014. The International Society for Augmented and Alternative Communication, ISAAC, is accused of flawed methodology in rejecting Facilitated Communication. “This outcome appears to have been contrived to protect the power of professionals and academics while ignoring the rights of communication for disabled people using FC”. Issue 40 Spring 2015. ‘Clarified’ guidance on school exclusions makes it easier for headteachers to expel pupils. “Yet another turn of the screw for pupils who are disproportionately excluded from school, particularly black pupils and pupils with SEN”. Issue 45 Autumn 2016. New UN guidelines confirm governments must phase out segregated ‘special’ education under Article 24 of the Convention on the Rights of Disabled People. “This closes down much of the wriggle room governments have been hiding behind”. Issue 46 Spring 2017. The government launches a review on residential special schools and colleges. “The review fails to ask the fundamental question: do we need these special schools and colleges if there is great local inclusive provision?”. Issue 48 Autumn 2017. The UN expresses deep concerns about the UK government’s failure to implement the rights of disabled people and says the approach has caused a ‘human catastrophe’. “We discover that the world has been listening and, better than that, has seen through the nonsense spouted by this government in the name of austerity and greater autonomy for education providers”.